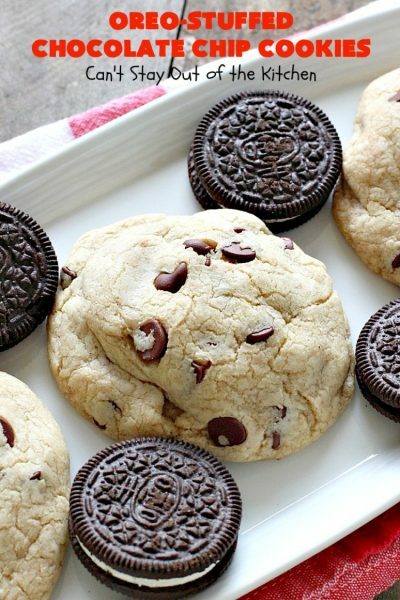 Oreo-Stuffed Chocolate Chip Cookies are beyond amazing. These cookies are monster-sized whoppers! 🙂 I mean these amazing goodies absolutely rock. A luscious chocolate chip cookie dough is wrapped around an Oreo cookie. Oh my. They are H-U-G-E and so sensational. Seriously, they are soooo big it’s like eating a whole meal. Prepare yourself for a chocolate sugar high like you’ve never experienced before! I’ve made Oreo Cookie Surprises before. 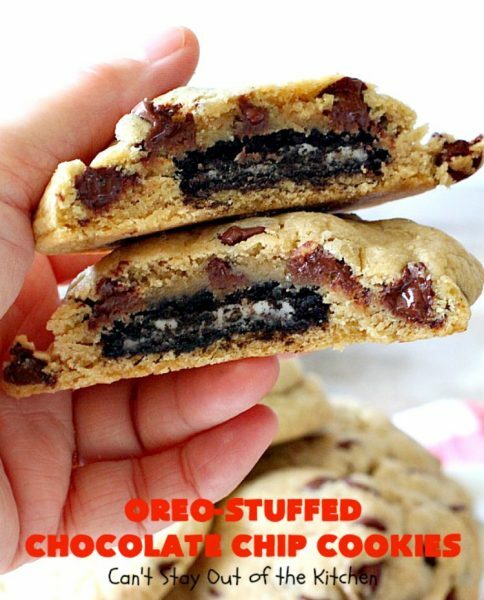 They’re a little similar with Oreos buried into cookie dough in brownie form. 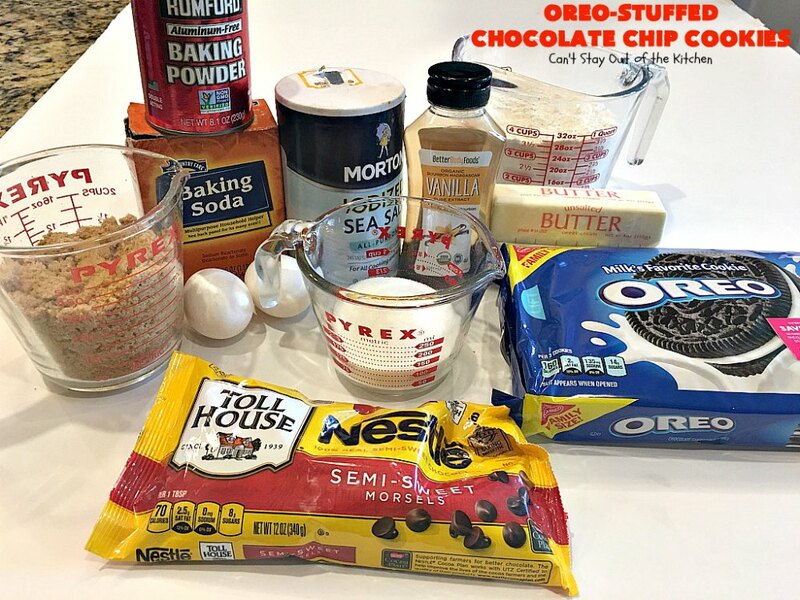 I’ve also made an Oreo Chocolate Chip Cookie, an Oreo Cheesecake Brownie, Oreo Truffles, Oreo Cookie Meltaways and even Cookies ‘n Cream Brownies. 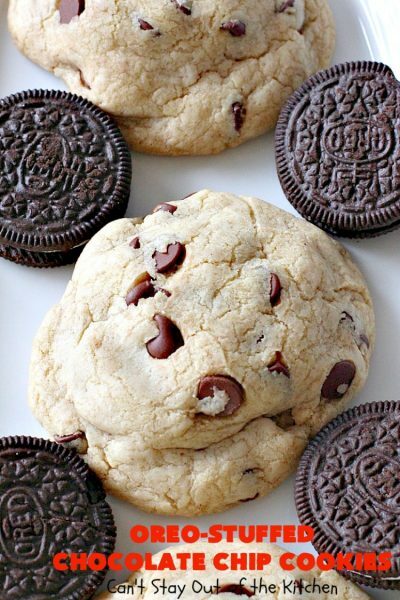 I LOVE Oreos. I love chocolate. I love sugar. 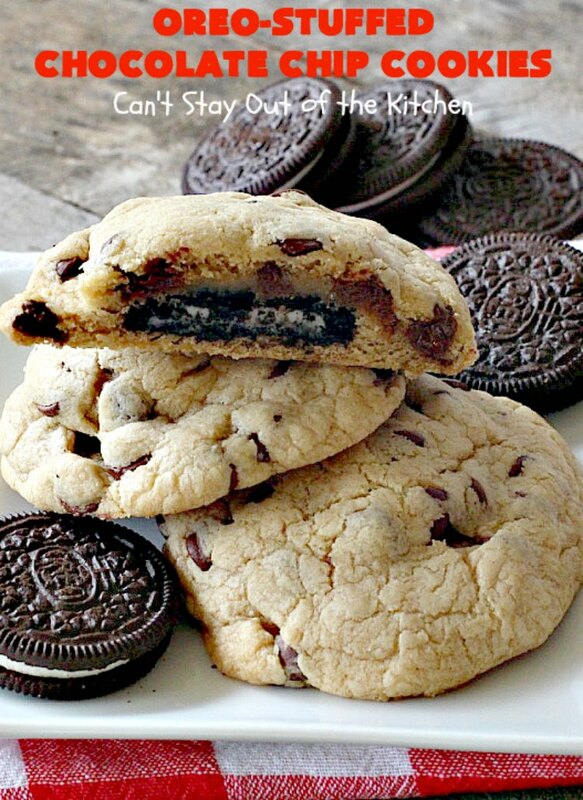 And, I loved these Oreo-Stuffed Chocolate Chip Cookies. These highly addictive cookies are a terrific treat for Christmas Cookie Exchanges and holiday baking and parties. In fact, you should consider making these for tailgating and Super Bowl parties as well! Let me tell you, no one will be able to keep their hands out of them. NO KIDDING! They are so extraordinary, you will be drooling after the first bite! 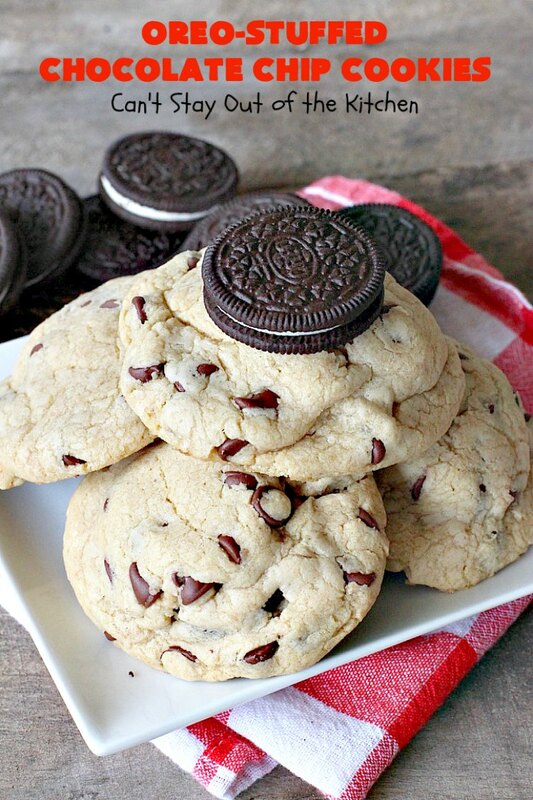 Oreo-Stuffed Chocolate Chip Cookies are one of the most fantastic cookies you’ll ever eat! I absolutely LOVED these sensational cookies. If you love Oreos, these Oreo-Stuffed Chocolate Chip Cookies are to die for! You will get a double dose of chocolate with these jewels. I used these ingredients. 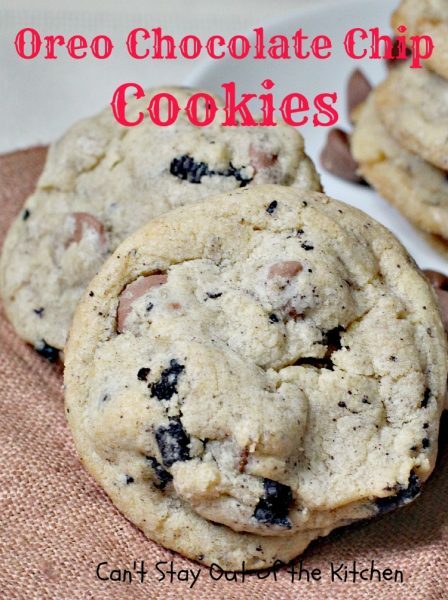 You will need two bags of chocolate chips for each batch. Soften butter. Add sugar, brown sugar, eggs, baking soda, baking powder, salt and vanilla. Add UNBLEACHED all-purpose flour. Bleached flour toughens baked goods. 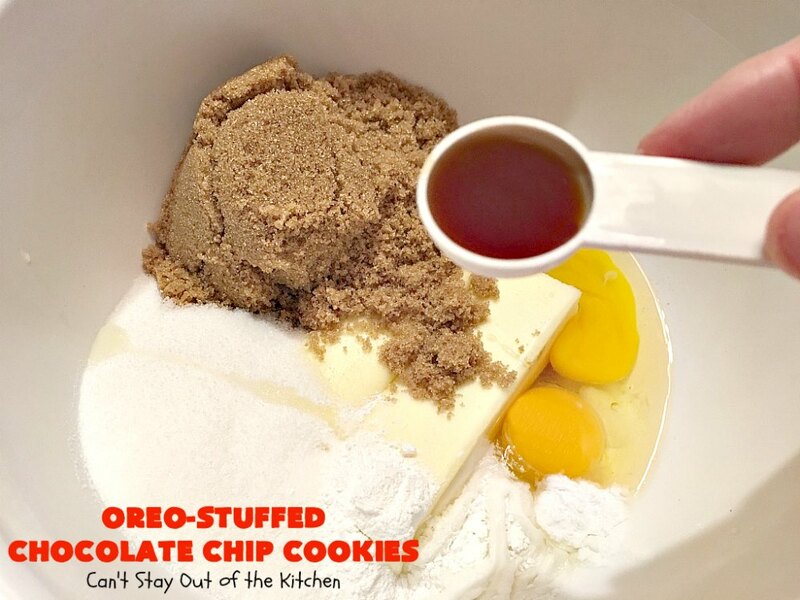 Add chocolate chips and stir until ingredients are completely combined. Form dough around an Oreo cookie. Here I’m smoothing the chocolate chip cookie dough around the cookie. Spray cookie sheets with cooking spray. Place shaped dough balls onto cookie sheet. I flattened the balls down with my hand. Bake at 350 about 20-24 minutes or until done. Rotate racks every eight minutes. 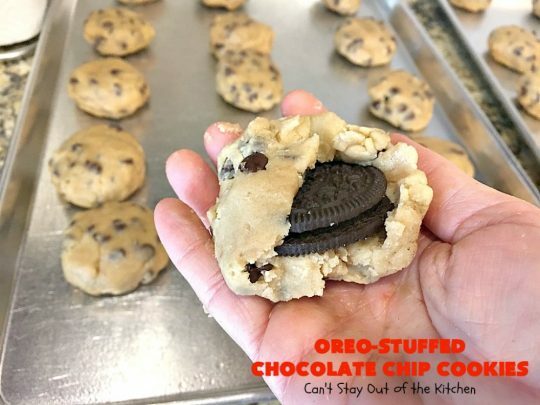 Oreo-Stuffed Chocolate Chip Cookies are the size of your palm! They’re big enough for a whole meal! Prepare yourself for a serious sugar high! These sensational monster-sized Chocolate Chip Cookies have a delightful surprise inside because they're stuffed with Oreo cookies! 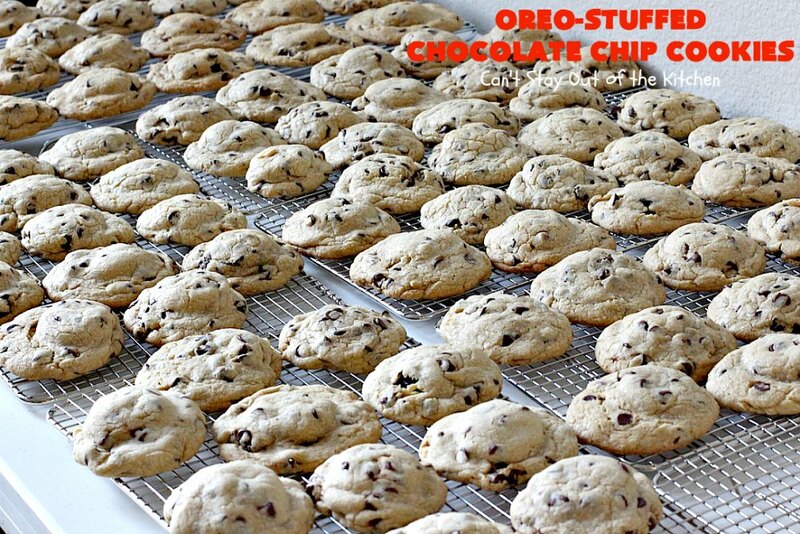 They are wonderful for Christmas Cookie Exchanges, holiday or tailgating parties or anytime you want to wow your guests. 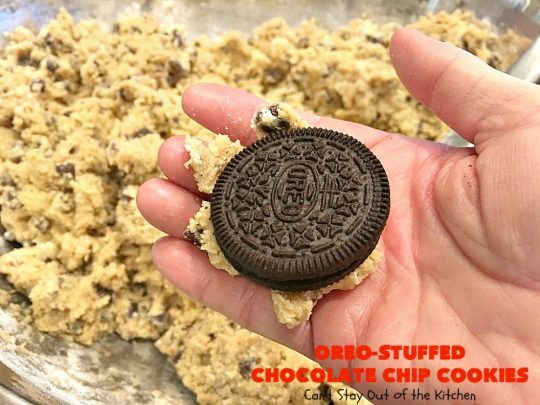 Shape dough with hands around a single Oreo cookie and place each ball of dough a several inches apart on greased cookie sheets. 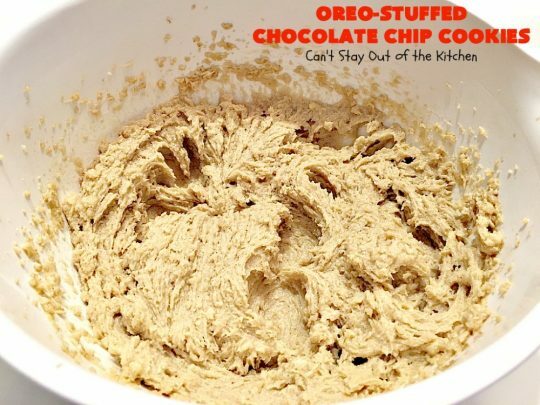 Flatten cookie dough down with the palms of your hands. 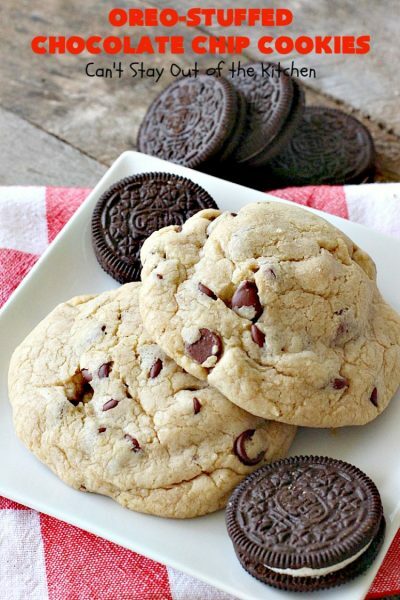 Bake for 20-24 minutes or until edges are light brown and cookies are done. 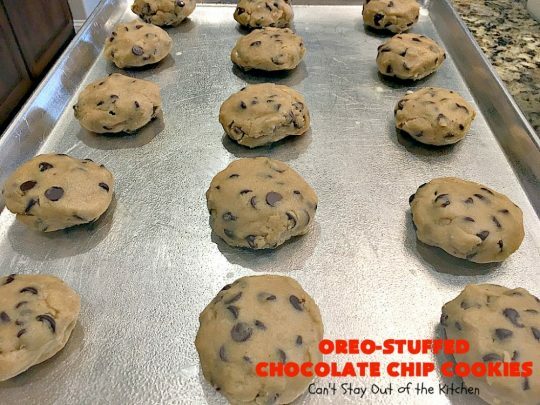 NOTE: There are times when I’m making a double batch of this recipe where I have to add an additional quarter to half cup of flour in order to get the texture right. If the dough gets too sticky, add a little flour to the batter. NOTE: I was baking three racks in the oven at a time with 12 cookies per cookie sheet (18x26” cookie sheets). My cookies took 24 minutes to bake. I rotated racks every eight minutes. These mammoth sized cookies will cure ANY sugar craving you have. I loved the way these cookies turned out. 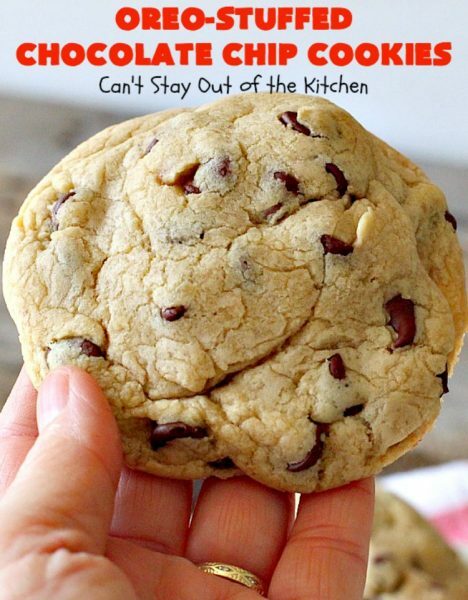 They’re such a large cookie, that it’s like eating about three normal-sized cookies. 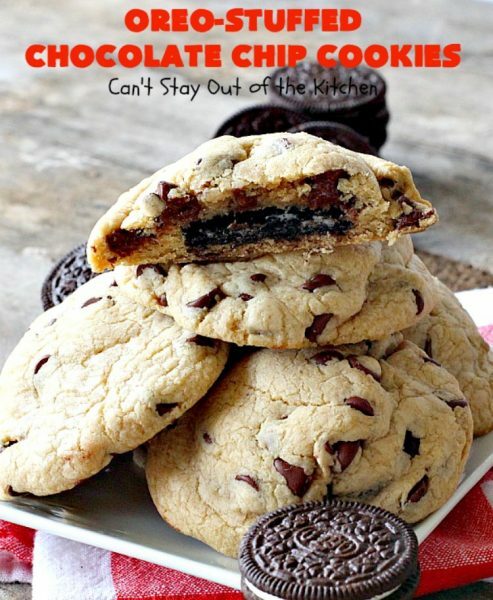 These are perfect for tailgating parties and the Super Bowl! 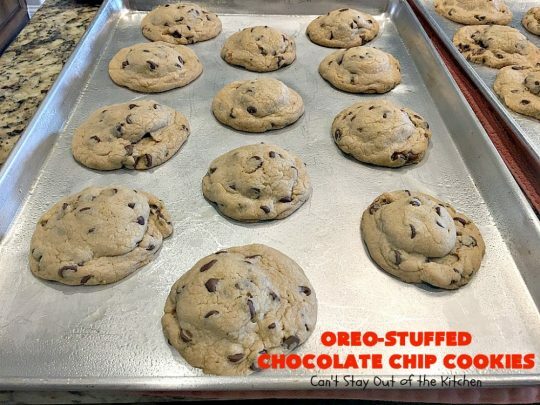 Oreo-Stuffed Chocolate Chip Cookies are also terrific for Christmas Cookie Exchanges and holiday parties. 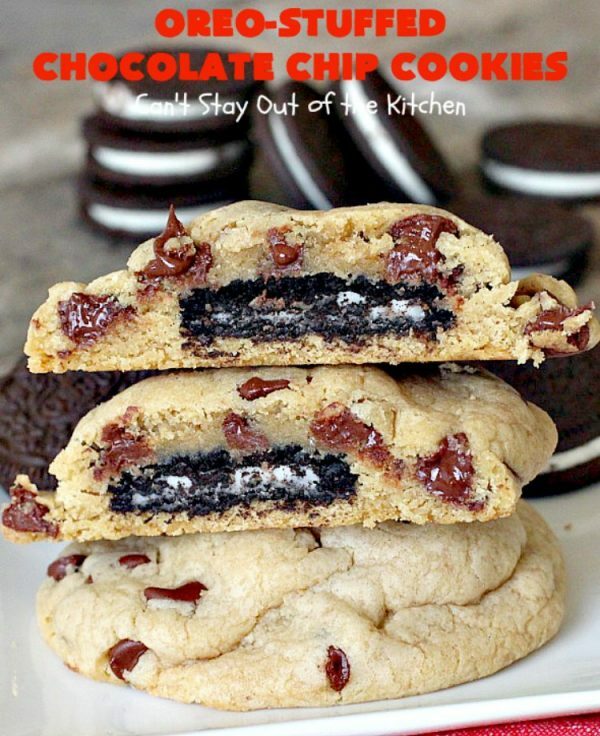 Prepare to have all your friends and family drooling and wanting more! The pictures are a great help/tool! Hi, Mona! These really were amazing. Thanks so much for stopping by.